Posted on October 19, 2015	by Katy K.
Just as a reminder – you still have time to enter the giveaway for Oddly Normal! I have a never-ending list of books to read for myself in print – but when it comes to audiobooks for the car that are exciting enough for my son and not too scary for my daughter, five years younger, it’s often a challenge. When I found this on the library shelf, I checked it out, even though it was the second in the series the first, which we hadn’t listened to, was nowhere in sight. 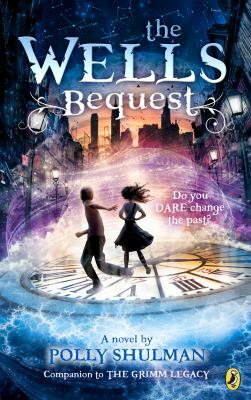 Wells Bequest by Polly Shulman. Narrated by Johnny Heller. Penguin Audio, 2013. Leo loves taking things apart and putting them back together again to do something else – but he’s the youngest and least scientific of a nerdy Russian immigrant family. He’s depressed thinking about what he might do for a science fair project that will live up to his family’s high standards, when a tiny flying machine appears in his bedroom. A tiny version of himself is riding on it – with his arms around the most beautiful girl in the world. He only really catches that he should read H.G. Wells’ The Time Machine before the tiny machine and the tiny people on it vanish again. Thinking of time machines leads him to want to do something related to that for his science fair project. His science teacher (a very cool sounding Korean-American woman brightly dyed hair) directs him to the New York Circulating Material Repository, a library where he can check out, if not time machines, at least early robots. When he gets there, not only does Leo find that the Repository is the coolest place ever, but also that his dream girl, whose name turns out to be Jaya, is the head page there. Before he quite knows what’s happened, Leo is working as a page at the Repository himself, and he and Jaya are racing to get a time machine in working order, to stop Simon, another page and rival for Jaya’s affections, from stealing Tesla’s death ray from the past and using it in the present. There were some references to the first book, The Grimm Legacy, but as it clearly had mostly different characters, it didn’t feel like we were being dumped into the middle of a story. I am always happy to find stories of magical libraries, and the New York Circulating Material Repository, which stores both regular historical artifacts as well as artifacts from fiction that have somehow become real, is a very fun one indeed. They all know it’s confusing and doesn’t quite make sense, and have conversations about it that were also hilarious. I liked both Leo and Jaya very much, and this gets points for diversity, both with Leo’s first-generation non-native English speaking immigrant family, and for Jaya, who is Indian-American. Heller reads with an energetic, lightly accented voice that felt just right for Leo, even if some of the minor characters’ accents didn’t come out quite right. Normally, I’m not a big fan of instalove, but this really worked for me. Leo’s not quite sure why he’s so drawn to Jaya, aside from her beautiful smile with one crooked tooth – but it’s a believable middle grade intense crush, focused more on her personality and intelligence than the physical attraction and nothing else that really turns me off. Leo also work hard to be friends with Jaya and has to overcome his shyness to do so in a way that I found adorable and did not cause my son to cover his face in embarrassment, as he has been known to do. This was an exciting story, with Leo and Jaya racing off in jets and all kinds of fictional methods of travel from submarines to time machines – but they were not in clear mortal danger until the very end. Since my youngest hates to be scared like that and my oldest wants his books to be exciting, this was a nearly perfect lighthearted, not-too-scary adventure. 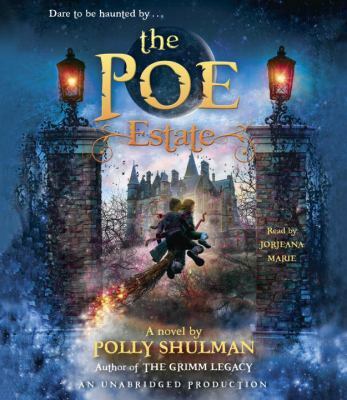 I requested the next book, The Poe Estate by Polly Shulman. Narrated by Jorjeana Marie. Penguin Random House/Listening Library, 2015 from the library, but ended up listening to it on my own. I’m glad that I did, because this one – perhaps predictably, given the subject – took a sharp turn from the fun adventure of the previous book. Our new heroine, Sukie, is dealing with a lot: her older sister, who’d always protected her from everything, died a few years ago. Now her parents haven’t been able to find enough work to live in the house they’d built for themselves, so they are moving in to the giant old family house of their aged Cousin Hepsibah. The whole first disc of the audiobook is about Kitty’s death and Sukie’s subsequent depression and losing all her friends. While Sukie meets some people collecting haunted artifacts and houses for the New York Circulating Material Repository fairly early on, it isn’t until far into the book that she actually gets to go there. (I was a little surprised that they needed a whole magical annex to store the haunted houses – I’m used to Greenfield Village, which stores its collection of historical houses on regular land, with historical transportation options to get around to them both for fun and the less mobile.) The last third of the book turns into more of the fun adventure, as Sukie and her friend race against ghost pirates to find a treasure – but that comes after and mixed with scary ghosts. There are kids who like scary, but for me, a dead sister turning evil is a different level of scary than the scary ghosts of unknown adults or the friendly ghosts of long-dead children that are more common in children’s books. I am sure there is still an audience for this one, but it’s not my kids, who don’t like scary and especially not siblings dying. The narrator sounded like she had a cold the whole time, which was also less appealing. We’ll probably still go back for The Grimm Legacy, though. This entry was posted in Books and tagged adventure, ghosts, youth audiobooks, youth fantasy. Bookmark the permalink.